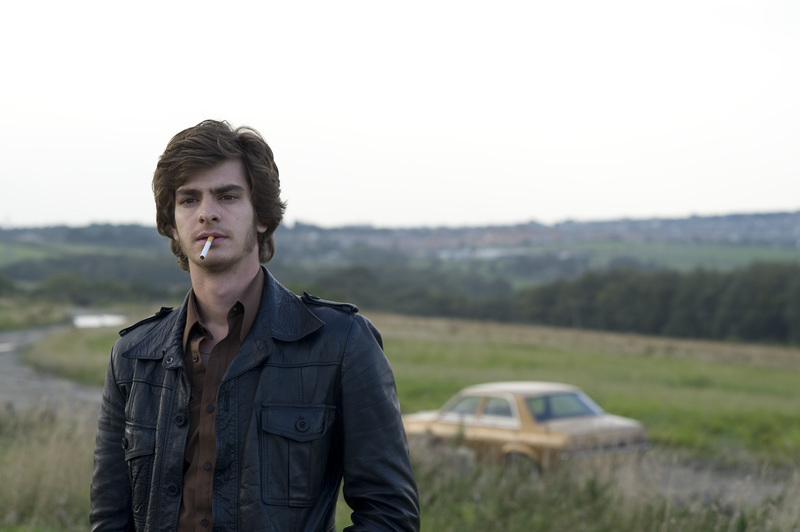 Eddie Dunford (Andrew Garfield) is a young reporter investigating the Yorkshire ripper. His research uncovers an illicit world of police corruption, racism, and brutality all under the shadow of the ripper’s killing spree. The Red Riding Trilogy is thematically very dark and is set over the course of a number of years, 1974 – 1983. The trilogy spans a very long 302 minutes and throughout viewers find themselves in a very unpleasant world full of corrupt authority figures and perhaps most pertinently a lack of justice. Based loosely on the real life Yorkshire ripper, the fictional counterpart in Red Riding enjoys a certain autonomy and a baffling ability to avoid being caught. The trilogy is based on a quartet of books written by David Peace. The television adaptation condenses this form into a trilogy but it remains relatively faithful to its source material. The first part is set in 1976 and it details Eddie Dunford’s story. He’s a young reporter who returns to the North of England for a new job and ostensibly a demotion. His ‘southern’ ways are derided and he finds himself very much separate from the carefully cultivated world of the locals. Always an outsider, Dunford manages to uncover some key information about the ripper; but it points the finger in directions that no one wants to explore any further. The second part follows the story of good cop Assistant Chief Constable Peter Hunter (Paddy Considine). He’s another outsider and he travels all the way from Manchester to head the investigation. His job isn’t easy however as the police he works with have very little to say to him. Hunter finds himself in an alien and threatening world and one where it’s increasingly difficult to ascertain anything close to the truth. The third part ties up a lot of the loose ends and fills in a number of narrative gaps. The Red Riding Trilogy is a detailed and developed television series and the above plot description really doesn’t do it any justice. It’s an intricate series of films and each builds and adds to the story begun in the preceding episode. The over arching themes are dealt with well and link each episode into a cohesive whole. The story delves into a stylistically dark place and that’s the only real constant throughout – that and the cruelty and greed that human nature is so capable of. There are a number of recurring characters and they inhabit a place that’s bleak, violent, and full of liars and lies. The story borrows from the real world but this isn’t a true story or even reflective of one. The Red Riding Trilogy is a mismatch of often-disparate parts and writer Tony Grisoni somehow pulls fact, fiction, and conspiracy theory into a palatable and coherent series. The Red Riding trilogy is ambitious in scope and Channel 4 has done well to make it so convincing. The time span that the trilogy encompasses is even reflected in the technology used to film the episodes. The first part is shot on 16mm, the second 35mm, and the final part in high-definition video. Each part is a distinctive film in its own right and a different director shoots each episode. This deliberate stylistic choice ensures that each part is visually stimulating and each director is fresh to the table. The cohesion comes from the skilful scripting and adaptation of the source material by Tony Grisoni. There’s a large cast of characters telling an even bigger story and viewers are forgiven if they get lost in the intricacies of the plot. There’s something reflective of the ripper investigation here in that the way the story is told is often from very different perspectives. This shifting focus reveals just how little each character really knows and even more importantly just how uninformed the viewer is. This is all deliberate of course and it reminds audiences that just like the police accounts in Red Riding, the narrative is open to some interpretation. It’s unlikely that Dunford and Hunter will ever find out anything concrete and as two separate individuals up against a corrupt institution the odds are clearly stacked against them. It’s hard to review this series without veering into key plot points but it’s even harder not to review it at all. The Red Riding Trilogy is dark and gritty television and the narrative plays second fiddle to the world that it exists in. The setting is an unforgiving and closed off place full of bad people, greed, and frightening evil. It’s an untamed backwater and the characters that we’re given to tame it seem woefully under-prepared. The Red Riding Trilogy is compelling television with a number of familiar actors. Andrew Garfield stands out as the young Eddie Dunford, Sean Bean does his bit and Paddy Considine (ever the professional) make this a gritty drama series worth watching.